Weequahic Park was known, among other things, for its sleigh riding and ice skating. It was also used as the home field for the Weequahic High School Soccer Team. I have many memories of Newark but I'd like to tell you about my experiences at Weequahic Park. My father first took me fishing there in 1949. We fished off the shore close to the Elizabeth Avenue entrance. We caught nice sunfish and calico bass. The area was nice and the fish were always biting. When I was 16 I fished off shore and I rented a rowboat from the boat rental area near the Frelinghuysen Ave. entrance. I remember the race track. The last time I fished there was in 1970. 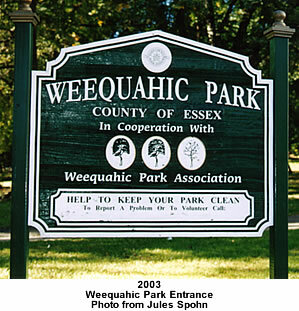 Weequahic Park, another of the county garden spots, is located at the southern end of the city. Its natural beauty and a great swamp which was susceptible of transformation into a lake impelled the park board to purchase the land as a reservation with the belief that it would eventually become an important part of the county park system. The public was quick to appreciate the advantages of the tract, however, and the commission soon found that the use of it justified its development as a park. Its western boundary was originally the Lehigh Valley Railroad, but in response to public demand the legislature authorized the acquisition of additional land extending the lines to Elizabeth Avenue. The present boundaries, therefore, are Dayton Street on the east, Meeker Avenue on the North, Elizabeth Avenue on the WEst and the Union County line on the south. This park contains 315 acres and is the largest one in Newark. The cost of the land was $339,546.11, and the park buildings on it called for the expenditure of $38,050. The improvements to date cost $267,580.61. As a park its chief beauty is found in the rolling character of the eland and a fine sheet of water 81 acres in extent. In the summer, boating and canoeing are enjoyed on the lake which also furnishes good sport for the fisherman, and in the winter hundreds of skaters make merry on the ice. The lake has a large population of ducks, geese, and swans. Athletic fields and tennis courts have been laid out in the park and in it a band stand has been erected. The special feature of this park is a trotting track on which in summer horsemen hold weekly matinees that attract thousands of spectators. The park is said to contain the last vestige in the county of the original forest. On one of its knolls, then known as Divident Hill, representatives from Newark and nearby Elizabeth met on May 20, 1668, to settle the question of the boundary line between the two municipalities. The name of the park is of Indian origin and is said to mean Deep Cove. The park has 2.06 miles of roads and 1.23 miles of walks. It contains nurseries in which are grown most of the trees and shrubs that are used in the development of the park system.